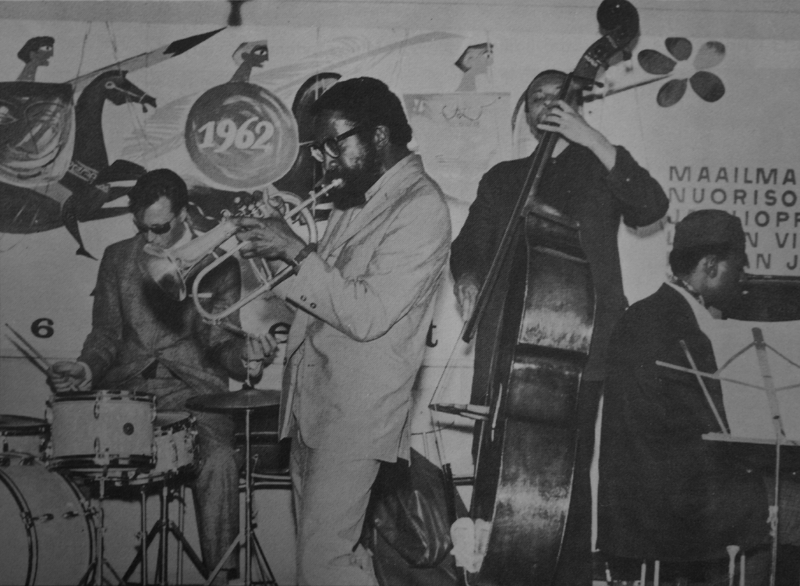 Free jazz performances of Bill Dixon and Archie Shepp's orchestra during the World Festival of Youth and Students, Helsinki, 1962. Archival materials from People's Archive in Helsinki. On June 6th PUBLICS will host the launch of a new project The Russian Bar: Why Relocate? New approach to neighborness and interchange by St Petersburg-based curatorial duo TOK. The idea of the ‘The Russian Bar’ is driven by the curators’ intention to analyze the dynamics of migration processes fueled by the political turbulence of the past and current decades, and find new languages and ways to articulate the changes they bring for local and global professional communities. Focusing on the local geographical context and the ‘new wave’ of emigration of Russians to Finland TOK curators would like to concentrate on the regional situation and revisit past and current Russian-Finnish conversations through the lens of the changing internal and external politics of the two countries. Presented in a format of a series of performances, talks, artistic interventions and small-scale exhibitions in different venues in Helsinki, the project will open with a discussion between llya Budraitskis, a historian, curator and activist from Moscow and Sezgin Boynik, writer and artist who lives in Helsinki. In their presentations they both will touch upon legacy and implications of the ‘Cold War’, which discourse seems urgent again in global political arena as well as in regional cultural policy. The ‘New Cold War’ has probably become one of the most widely-used expressions in an aggressive international public polemic including Russian-Finnish relation. The recent political events in Russia affected Finland as well: the sanctions, deteriorating economic conditions in Russia, growing immigration to Finland, problematic division of border territories, NATO question have created the situation when the relations between the two countries as well as subtlety of their internal politics need to be again reconsidered and studied. Ilya will focus on the ‘Cold war’ discourse in the current Russian public sphere, both from pro-Kremlin camp and liberal opposition. This discourse, partly exported from other epoch to our time, now produces the new lines of conflict within the society. These imaginary lines between the loyalist majority and pro-Western ‘new dissidents’ in fact, covers the real contradictions in the present Russian society and serve the ideological interest of the ruling elite. In this construction minority defined mostly not as the political, but as moral: there are the people, who escape in different ways from the ‘moral catastrophe’ of the present Russia. Sezgin’s presentation will question the usual schematization of the Cold War cultural politics as the contradiction between capitalist (Western) forms of free expression (jazz, abstract painting, non-figurative sculpture) and socialist (Eastern) forms of committed art (socialist-realism, propaganda, lyrical narrative). He’ll argue that the Cold War discourse is conceptually inadequate to deal with the complex layers of artistic practices, and also will discuss in which way the curatorial practices in contemporary art today are reiterating the same ideological schema of the Cold War by recuperating the contradictions of artistic practices to the play of the cultural and ethnic identities. TOK (The Creative Association of Curators) is a female curatorial duo from St Petersburg founded by Anna Bitkina and Maria Veits in 2010 as a platform for conducting interdisciplinary projects in the fields of contemporary art and social sciences. TOK’s research-based art and educational projects have a strong social component and deal with current issues that are widely discussed both in Russia and internationally such as public space and citizens, development of education, deprivation of social resources, collective memory, growing role of the media in the global society, changing political climate, migration policy and many others. Ilya Budraitskis is a historian and curator based in Moscow, Russia. He is on the editorial boards of several print and online publications, including Moscow Art Magazine and LeftEast. For now he is lecturing in the Moscow High School for Social and Economic Sciences and the Institute for Contemporary Art. With Ekaterina Degot and Marta Dziewanska, Budraitskis co-edited and authored the book Post-Post-Soviet? : Art, Politics and Society in Russia at the Turn of the Decade (University of Chicago Press, 2013). His book Dissidents Among Dissidents (FMP press, Moscow, 2017) was recently awarded the Andrei Bely prize. Sezgin Boynik is a theoretician based in Helsinki. He completed his PhD on Yugoslav “Black Wave” cinema. Co-edited Nationalism and Contemporary Art: Critical Reader (MM & Exit, 2007), and History of Punk and Underground in Turkey (BAS, 2008). Recent publications include Noise After Babel (Spector Books, 2015), On Lenin: Atlases, Herbariums, Rituals (Checkpoint Helsinki, 2017), and the articles “Ideologies of Artistic Education” (Inca Press, 2016) and “Filming the Uprising People” (Moderna Galerija, 2017). He is editor-in-chief of Rab-Rab: journal for political and formal inquiries in art. ‘The Russian Bar’ will be presented as a series of events in different venues in Helsinki in June and August-September 2018 and will result in a final publication that will include interviews, articles and information about the project participants and their works. The project is supported by Kone Foundation.